WTOP news anchor Stephanie Gaines-Bryant has run the Marine Corps 10K five times and the marathon twice. 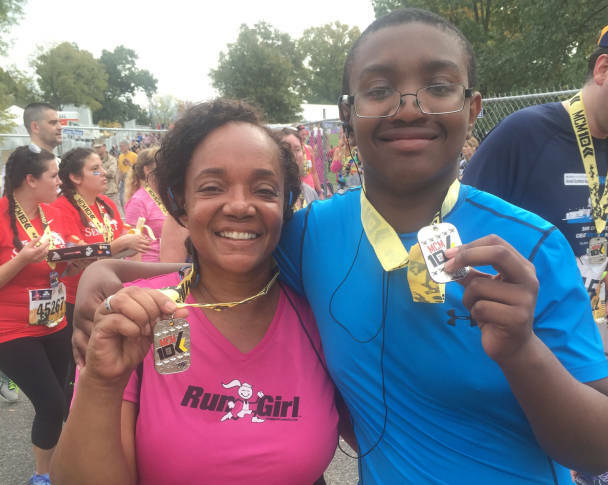 But this year, she ran with her son, Gabriel, who has autism spectrum disorder. She shares their story in her own words. 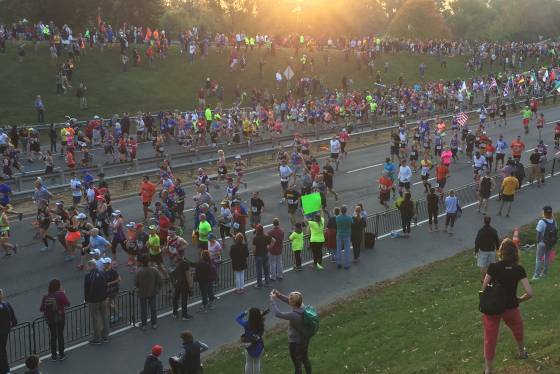 Photos from the 41st Marine Corps Marathon on Sunday, Oct. 30, 2016. It never occurred to me that I might be pregnant. I thought it was a combination of PMS, bad nerves and a too-soft mattress. I was running my first 13-mile race in a strange city. I was lying on a marshmallow-soft mattress in a bedroom that wasn’t my own. Besides that, just before my twins were born 18 months earlier, my doctor told me that, given my health history, there was a one-in-a-million chance of my becoming pregnant again. Eight months after crossing that mini-marathon finish line, our one-in-a-million baby was born. Gabriel Matthew Bryant came into the world on Jan. 5, 2003, at 12:41 a.m. He joined 4-year-old Richard Jr. (Ricky) and our 2-year-old twins — son Christian and daughter Kendall. I noticed when Gabe was about a year old that he wasn’t making the milestones the other children had made at his age. He was walking at 9 months, but at 12 months, he wasn’t talking. He had few words and many tears. Gabriel cried constantly. The smallest things seemed to set him off: not feeding him fast enough, putting a shirt over his head while dressing him or a toy that wasn’t where he thought he left it. The most disturbing sign for me was that he didn’t appear to recognize me as his mother. Each day when I would come home from work, he would act as if he was seeing me for the very first time. When I would walk through the door, the other children would excitedly swarm toward me screaming “Mommy, Mommy.” They would hang on my legs, my arms, my ankles eager for kisses and hugs. Not Gabe. He would glance up at me simply because he was curious about the sudden commotion in the room, then he would immediately focus his attention back on whatever he was doing, whether it was pushing a toy truck or rolling a ball. He wouldn’t make eye contact with me and would squirm away when I tried to hold or touch him. He wouldn’t answer when I called his name, even though his pediatrician said his hearing was perfectly normal. Weekends were one endless tantrum until the babysitter returned. Delia’s presence was the only thing that seemed to calm him. I feared that Gabe thought our babysitter was his mother. Something was wrong and I didn’t know what to do or who to talk to. I confided in a friend who recommended I contact the Prince George’s County’s Early Childhood Education program. That phone call got the ball rolling. It began a long but thorough process of appointments, tests, evaluations and, finally, a diagnosis. Gabe was initially diagnosed with developmental delays and a few years later with autism spectrum disorder. He is on the mild end of the spectrum. Gabe finally began talking at age 3 — about the same time he started a special preschool program — and he hasn’t stopped since. His aversion to touch also changed around that age, when we moved to Connecticut. My husband, a naval officer at the time, was assigned to a submarine in Groton, Connecticut. The family moved from the D.C. area to Groton and I became a stay-at-home mom. Over the next two years, I spent much of my time helping him get to know me. By the time we returned to Maryland, he recognized without a doubt that I was Mommy. Gabe has been in a general classroom since kindergarten and has functioned without a classroom aide since fifth grade. He’s currently in eighth grade; he’s a straight-A student and an exceptional clarinet player. Most of our issues at this point have to do with socialization. He can be awkward and somewhat passive, which sometimes makes him an easy target for bullies. His size didn’t help. At 12 years old, he was 5 feet 6 inches tall and weighed almost 200 pounds. He didn’t seem to realize when he was full, so he would eat and eat until we’d make him stop. We made him take karate lessons twice a week, but it wasn’t enough to burn the calories he was taking in. My oldest son, Ricky, who’s a health and fitness fanatic, asked whether he could come up with a fitness plan for Gabe. The plan included two days of weight training and three days of cardio per week. We also began monitoring his food intake more closely. No more casserole-sized bowls of Captain Crunch and only one helping of dinner at night. No more seconds and thirds. We replaced sugary juices with water. No more supersized meals on Saturdays, which is fast food day in our household. Gabe followed Ricky’s plan to the letter, especially once he started seeing results. He also realized he enjoyed working out — especially the cardio, which included 30 minutes on the treadmill or stationary bike in our basement. Like me, he found the rhythm of running soothing. By the end of the school year, Gabe had dropped 25 pounds. Gabe then decided he wanted to take up a sport. He wanted to be a wrestler like his brothers Ricky and Christian. My immediate response was no. Over the years, the boys have wrestled several skilled autistic opponents, but I didn’t think Gabe’s personality or temperament was a good match for that sport. Although wrestling is a team sport, it’s extremely personal and full of emotional ups and downs. I wasn’t sure how my gentle, sensitive child would respond to the challenges. I enrolled him in a five-day summer wrestling camp that was advertised as a beginner’s camp. It quickly became clear to us that the camp wasn’t for beginners. It was also evident that neither the coaches nor the students were sensitive to Gabe’s newness to the sport or to his special needs. He had difficulty catching on to basic moves that the other boys already knew, which easily frustrated him. He began exhibiting behaviors we hadn’t seen in a long time: screaming outbursts and crying fits. We ended up leaving the camp a day early. He was devastated. He said he felt like a failure, even though we assured him otherwise. A few days after the camp episode, he stopped me as I was leaving the house for my morning run. All of his life, he’s seen me run out the door with my earbuds, cellphone and running shoes. That morning he asked if he could come with me. We drove to my favorite running spot: Allen Pond Park’s running trail is a flat, paved loop around a man-made pond. The scenic park in Bowie, Maryland, includes an ice rink, a skate park, an amphitheater and a stocked fishing pond. I’ve been a regular runner there for almost two decades. I run twice around the .6-mile inner loop then I exit the park, cross Northview Drive and enter the trail that leads to another favorite park, Centennial Park. Running with Gabriel was different from running with Ricky, who was my weekend running partner every year after wrestling season. Ricky stayed by my side at all times, talking about everything from global warming to who he planned to take to prom. Gabe wanted to run alone at his own pace, which is much faster than mine, and zone out on the trap music on his iPhone. I was fine with that as long as he stayed in the park, but first I had to teach him the rules of the road. He quickly saw that road running was different from running on a treadmill. The first challenge was teaching him to stay in his own lane. He wanted to take up the entire path. I had to teach him to pass on the right. He also had to learn about personal running space. Don’t run on someone’s heels or charge toward a walker or runner assuming they’ll move out of your way. We also worked on form and pace. Shoulders back, chest up. Don’t slump or shuffle. Pick up your feet. Don’t run all-out in the first 10 minutes. Pace yourself. Pay attention to your surroundings: Only keep one earbud in at a time so that you’re always aware of what’s going on around you. I began to look forward to my daily summer runs with Gabriel. A few weeks after our first run, I signed us up for the Marine Corps 10K as motivation to keep up our regular routine. I’ve run the race five times and knew it was well organized and fun. When the school year started, we were limited to running on the weekends, but he continued his treadmill runs during the week. On Saturdays, we would do an easy 2- to 3-miler. On Sundays, we would do our long 4- to 6-mile run. We arrived at the North Pentagon parking lot where this year’s 10K began about an hour before the race’s start time. We ate the bagels I heated and wrapped before we left the house, and we made a final trip to the portable toilets. The race started promptly at 9:15 a.m. I could see the excitement in his eyes as we approached the start line, which was decorated with a large arc of red Marine Corps balloons. He had never seen so many people gathered in one place: More than 5,000 people of all races, ages and sizes in colorful race attire filled the race corral. The gun went off, causing Gabe to jump and then, to laugh. Once we crossed the start line, he dashed ahead of me the same way he did during our training runs. When he realized I was no longer by his side, he stopped and waited for me. Once I caught up, he dashed ahead again, then stopped when he didn’t see me. This went on for about a mile until I finally waved him on. He needed to run his own race. He waited for me just before the end of the race. We climbed up Marshall Drive to the finish line at the Marine Corps War Memorial and crossed the finish line together. When a handsome young Marine placed the finisher’s medal around Gabe’s neck, I knew it was just one of many victories to come.